It could have been some hours of a tourist being footloose in Berlin, Beijing or Beunos Aires – a time of loose impressions, Cairo, Cape Town, Khatmandu. Yet, for me, there is the privilege of a greater familiarity, an affection, that the tourist cannot have. Some hours in Antibes… from the bus ride to la centre ville you see ads, billboards, posters -Charlize Theron in White Snow, the Afrikaans girl from Benoni, probably South Africa’s greatest acting export; you see Alain Delon, a large close-up of the film actor who was sharply handsome, his features now flattened by time; you see Charlize Theron (again), declaring archly to the world, J’adore Dior. In the distance across the fringe of yacht masts in Port Vaubanis the familiar shape of Fort Carré, four-cornered, echoed distantly in the five-cornered Fort in Cape Town – can we claim one-up-manship? Admittedly, ours was erected more than a century later. The centre ville is crowded; it is tourist season, the elderly and young couples with their kids. I pass through the Place de la Resistance with its statue commemorating the struggle in World War Two. He reminds me, this figure, of the Michaelangelo’s unfinished figures in the Galleria Academica in Florence, breaking, breaking from their rock. in Antipolis for two days. A memorable performance it must have been and it’s nice to know they didn’t just live for war. And the alley-ways – that is what they would be to us – these places Celebrate Food, the No. 1 past-time of the French. At least half of these little restaurants though, are foreign – Arabic, Indian, Thai, Sushi, and so on. It would seem that either the French are tiring of their Provencal traditions in gourmandizing or the catering is mainly for tourists. The young people, often with a pram, sit on the sidewalks and eat take-aways. Not surprising when you see that the plat du jour (dish of the day) can be R200. I went to the English bookshop, quite a thriving place, it seems. Strange not to see a single French book there and hear the central London (?) accent of the woman behind the counter. What intrigued me was the basement with all the secondhand books – being part of Les Remparts, the building is old and the low roof of the basement is gothic in shape with rough arches. But a bookshop like this… it reminds one again that the population of this town as with so many other places in Provence has gathered the nations of the world. Antibes is different from Nice, from Cannes and the other coastal cities. The Antibois (Antibeans) are proud of the many artists and celebrities that have also found that difference and made this place their own… happy exiles all: Guy de Maupassant; George Sand; Jacques Prévert; Picasso; Nicolas de Stael; Hans Hartung; Monet; Renoir; Colette; Kazantzakis; the Duke and Duchess of Windsor. Perhaps it is the contained image of Les Remparts against the backdrop of the snow-capped Alpes Maritime. Somehow that history is small and proud; you can see into the sixteenth and seventeeth centuries, into the medieval world, more easily. It is engaging and provincial in a way that the ostentation of Nice, Cannes and Monaco is not. I have lived in Antibes for more than twenty years. I have known each town that there is here for more than 40 years. Of all the towns Antibes is the only one that has conserved her soul so well, and the only one that I feel at home in. Quotation by Graham Greene: Editions Art. Paris 1991. He is the first major painter to embrace modern form in his design, specifically the form of the machine. A painting that he did in 1905, My Mother’s Garden, as the Fauves took the scene by storm, is pure impressionism. He was 24 and had been rejected as a student by the Ecole des Beaux Arts. (It would be interesting to research how many great writers, artists, etc., have been rejected by petty minds.) But he stuck to his guns (cf. later) and in the creative climate of the Cubists in Paris, he attended a retrospective of Cezanne’s work and in 1912 he painted La Femme en Bleu, the turning-point in his career. I saw it at the museum. It was André Malraux that established not only the Léger museum, but the Chagall museum as well – where are more politicians like this? 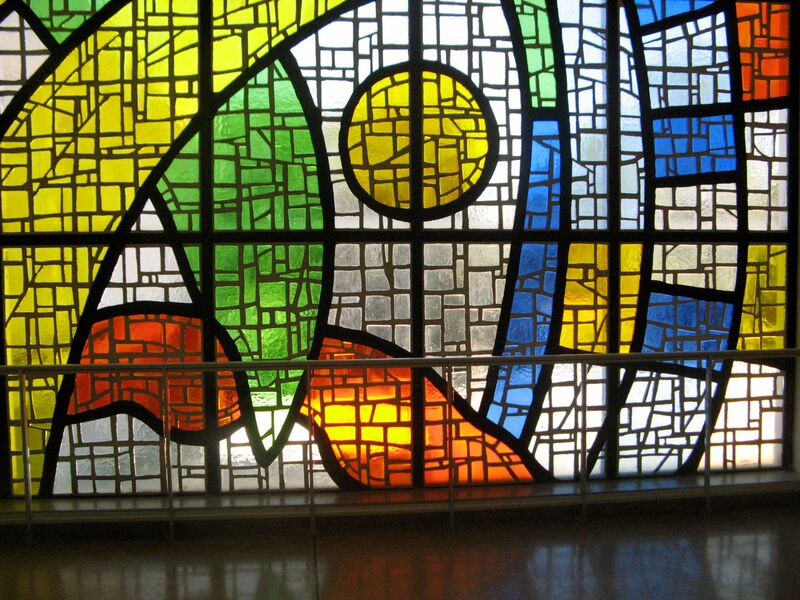 In 1960 the inauguration of the Léger Museum was attended by Chagall himself, Picasso and Braque. It was five years since Léger’s death. 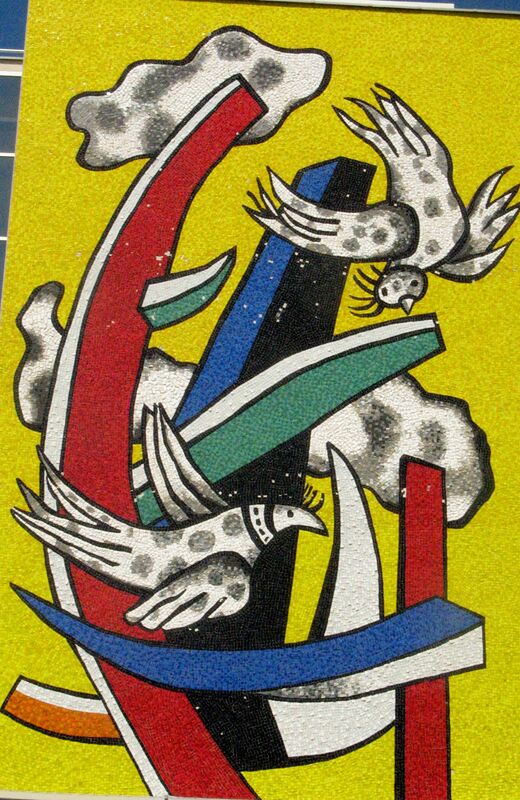 Permission had been granted to reproduce Léger’s designs as abstract murals and the result is striking. 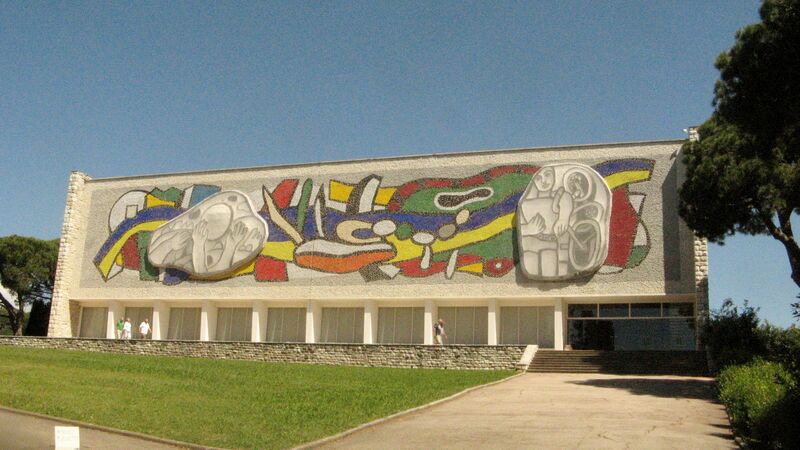 Comosition Murale is 25 X 12 metres; the three murals above the parking area are 15 metres each and the façade of the Museum itself is an abstract probably 20 X 8 metres. The Léger Museum dwarfs the Chagall Museum. 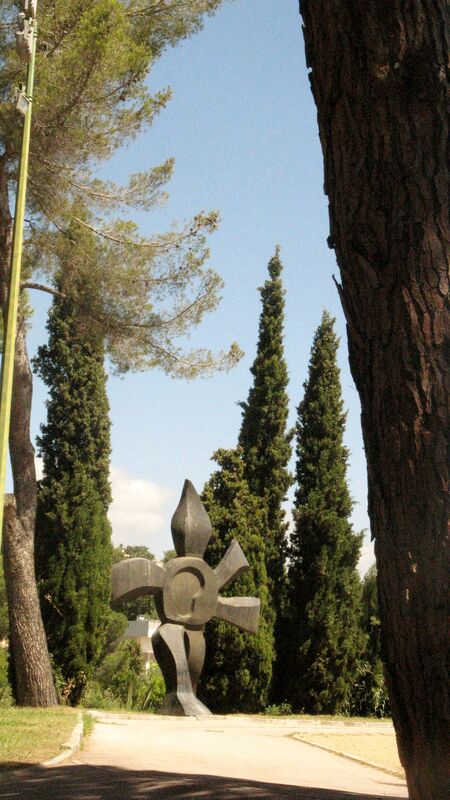 In the gardens there are ceramic and metal friezes and a sculpture in steel six metres high between cypresses overlooking the Biot valley. You go in at the entrance and find yourself bathed in light of primary colours – stained glass windows about 10 metres tall, designs happily tropical. On the wall are the biographical details. In 1917 Léger, in a trench at Verdun, nearly died in a mustard gas attack by the Germans. Perhaps that experience left him dour – the heavy moustache makes him look like a baker. But the details did remind me of the tragic deaths of August Macke and Franz Marck, two brilliant German artists who died in those trenches two years before that. What does this thing called war do to us? In the permanent collection are works from the first decade of the 20th-century – a nuanced, realistic portrait of his uncle; work from the 1920s and 1930s when his “mechanistic” phase was at its height and compositions after the Second World War – abstractions with floating rags of black (no painting without black), green, yellow, red, blue. It is interesting for me to see how he portrays human beings. “The human figure,” he says, “has plastic value, not sentimental value.” Those figures that populate his canvases, look as if they are constructed from plastic tubes and yet they have a humanity. The textures are never far from a metallic sheen: he once said that the most beautiful thing for him was the sheen on the barrel of a revolver. These were the guns he stuck to. 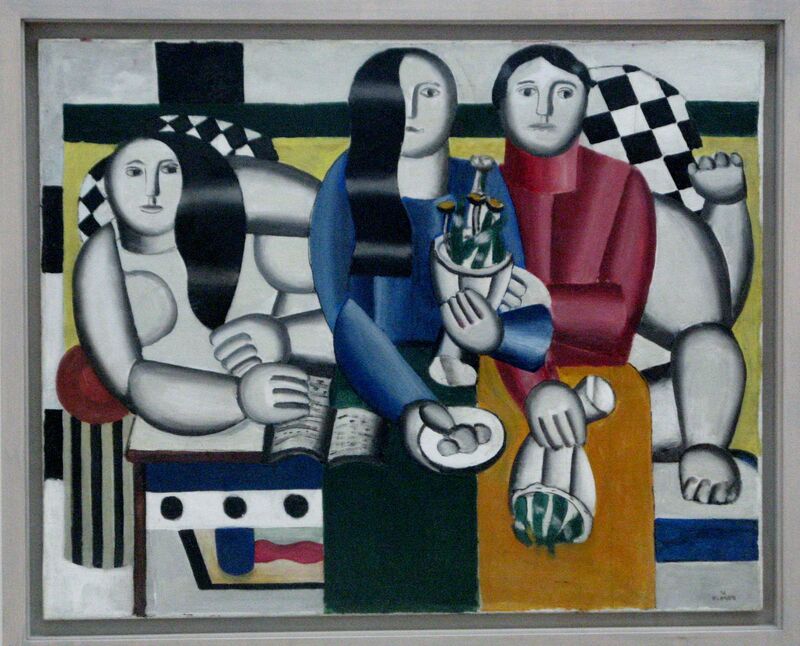 This is the spirit of modernism and it is easy to see why some have said Léger was the father of Pop Art. I left early and thought to explore the village of Biot where I had seen the glass factory. I recognized the tradition of town building – the dwellings clustering at the top of a hill, pinnacled by the church tower. To get there I trekked up the narrow cobbled streets of the Middle Ages. The Church, I saw, was built in the 15th-century, though I couldn’t see the interior because of renovations. The street signs are all bilingual, something I haven’t seen in Provence: Le Cul de Sac / Lou Cuou de Saco. The glass industry of Biot probably has its roots in Italy, and in Venice, in particular. As you approach Nice with the sea on the right buffered by the airport, you see one or two modern buildings on the left, but they only peep out as the enviebus flashes by. Probably from the late-1980s the area called l’Arenas was developed as a city hub. To have done this within traditional Nice would have been a disaster, but older cultures appreciate this and protect their own. The place is a marvel and it never ceases to amaze me that I have known of the tips of icebergs, but, on walking there, under the sky-daring edifices of this quarter, I find the true extent of it. Banks, insurance houses, upmarket hotels… there’s nothing small in this urban development, buildings that create a series of les places or large piazzas. 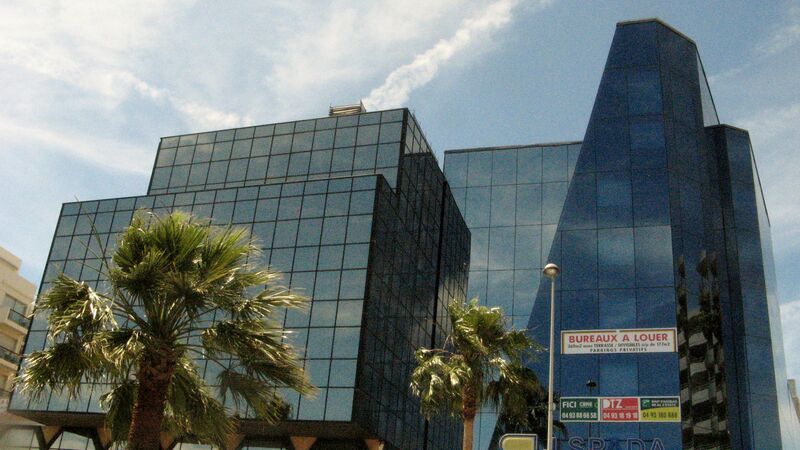 It is a panorama of post-modern architecture with a sense of having the gargantuan bases of the buildings scattered there, instead of lined up neatly. Strangely, it pays respect to the scattered quality of the vieille ville in each medieval city, the parts that rose up before anyone had thought of urban planning. The design dwarfs the tradition of three, four storeys in old streets – see Antibes, see Nice, see Paris. And glass… entire facades of these sky-reachers are huge panels of reflecting glass. It lends at once a lightness that sheer granite would not and at the same time you look at the opaque burgundy of sunglasses: what happens behind these vast facades is private. The immense reflections fascinated me – the buildings reflect each other in bloodless cameraderie. The flambouyance of the 19th-century, the grace and twirl of the beach front hotels on the Promenade des Anglais, famous in the world, have evaporated. This is all square. Overlooking the largest of the Arena spaces, a step-terraced park area, there is an artwork of l’Enfant fou – a rough ceramic disc with a text on the one side and on the other, a strange child-within-child image, almost cherubic baroque in style. The text reads: the child sees through the eyes of the mad child… An odd moment in this landscape of human rationality. It was hot and I had one more building to see, one that was along the Promenade. I walked (and walked). The wind was lashing the sea, flecking it with seahorses, as my mother used to call them, very different to the still sheen of last December when I walked along here. I reached it – perhaps the last of the starkly modern buildings before the traditional hotels begin. It is called the Spada, or, at least, that is what I’m calling it. A striking design, it is a glass-clad rectangle next to a glass-clad wedge. It looks for all the world like pieces that have been cleaved apart. It is interesting to see what a sloping line like that does to the entire feel of a large building. It never ceases to move somehow. It was a day with the Russians. 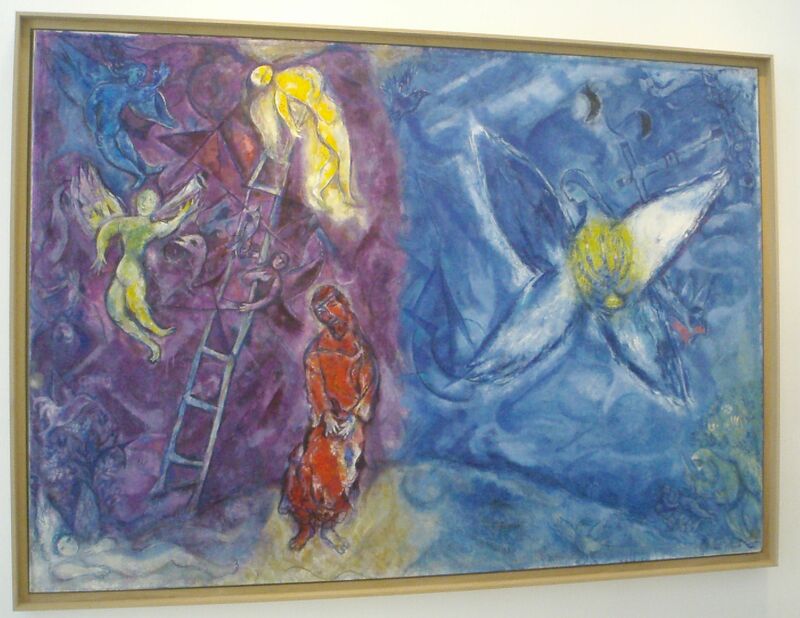 First, the visit to the Cathedral and then a national museum housing a particular collection of Marc Chagall’s paintings. 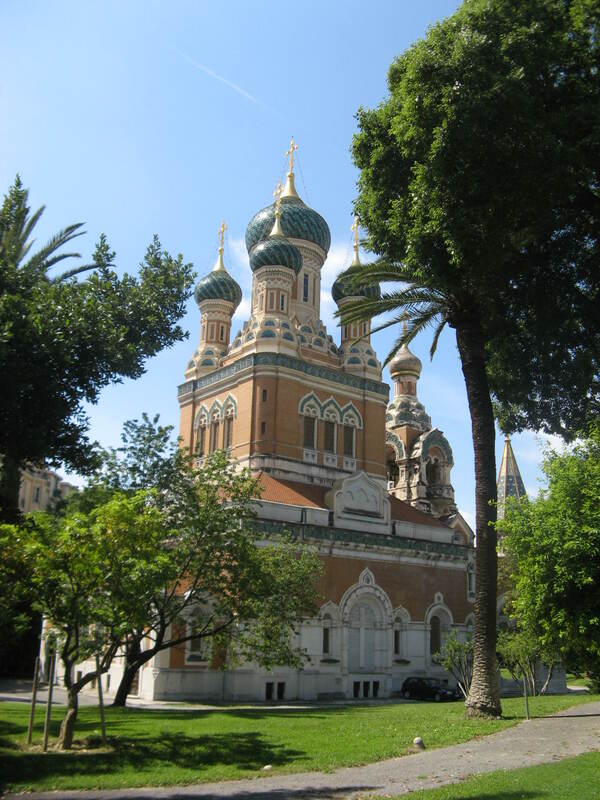 The museum is in the Cimiez district of Nice, a suburb with the Roman Arena and the Matisse museum, raised on a hill above the rest of the city. An unassuming building, it was established in the mid-1950s at the behest of André Malraux who was also a prime mover in the establishing of the Fernand Leger Museum. The paintings in this museum are Biblical. 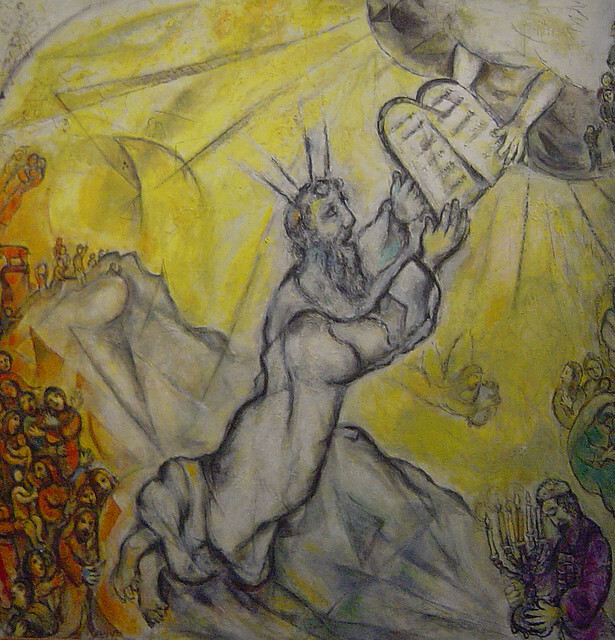 A series of nine paintings, done between 1931 and the early 1950s, illustrate themes like Creation, Jacob wrestling with the Angel, Jacob’s Ladder, Moses receiving the Tablets, the Exodus from Egypt, Abraham and Isaac. Each of these works is 2.5 X 2.5 m. and displayed in a continuous space that may be described as a generous zig-zag so that you view each work in isolation from the others. 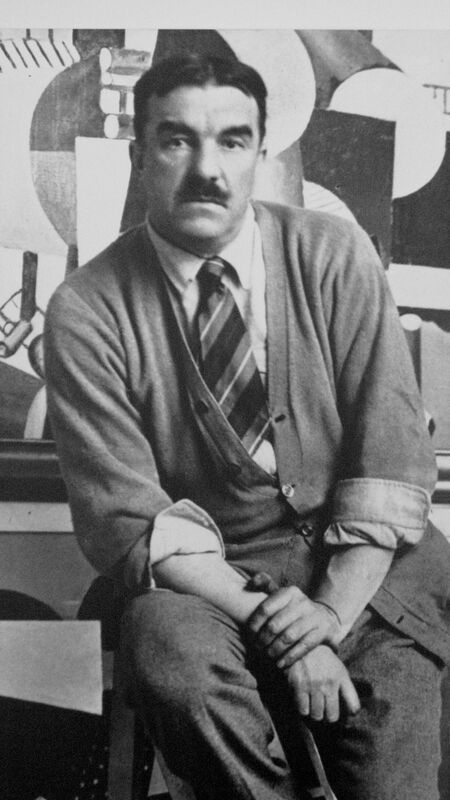 The contents of what he did here is more gentle that his cubist work. It is lovingly folklorish, illustrative rather than self-conscious compositions. 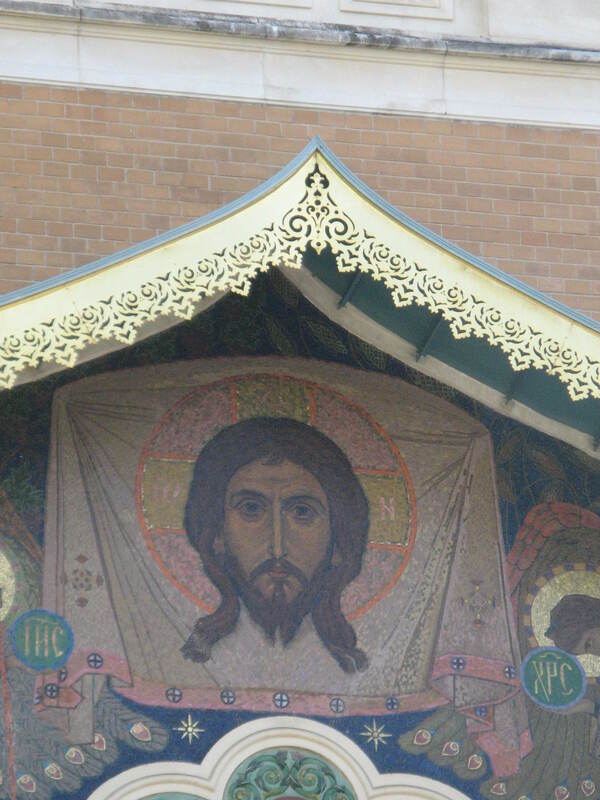 Often the images are symbolic, private and have to be teased out, but all are expressions of his deeply felt spirituality. The images swirl and rise from violet depths, with swaths of brightness here and there, sometimes a crimson glowing. There is a humanity here – the Angel that wrestles with Jacob simply touches the forehead of Jacob kneeling at his feet. In three of the paintings – Jacob wrestling with the Angel, Moses receiving the Tablets and Abraham and Isaac – there are crucifixion scenes in the background, unusual for his Jewish inheritance. His compassionate worldview transcends the confines of his upbringing. 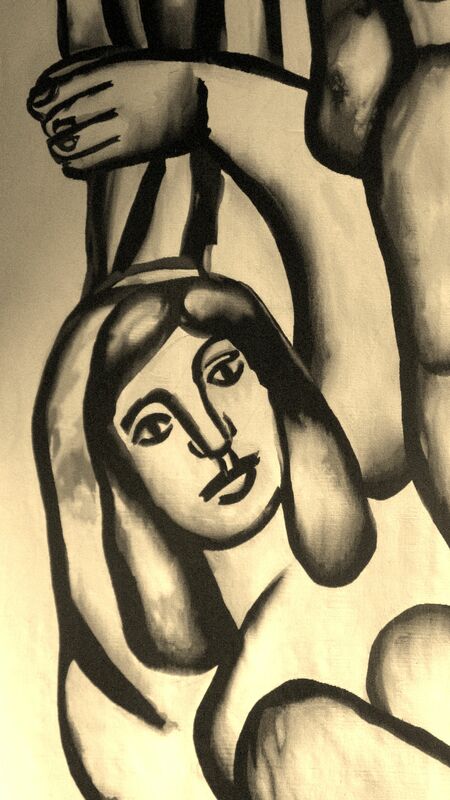 There is a small hall with work depicting motifs from The Song of Songs, dream-like images of marriage and one of them close to Peynet’s Les Amoureaux with the Eiffel Tower in the background. Outside in a courtyard is a huge mosaic of the Signs of the Zodiac that he completed at the time of the Museum’s inauguration. On the wall of the museum they have a history of Chagall’s life. One detail struck me: a senior in the French government managed to persuade the Nazis, who had already arrested Chagall, that there would be no benefit in his deportation to the camps for them. They had the grace, that once, to listen. Ek verbeel my ek staan op die oewers van die Volga in Moskou voor die Katedraal van Hl. Basil. Maar ek ruk my nugter: ek is in Nice voor die grootste Russiese katedraal buite Rusland. En soos ander toeriste is ek verbaas: die aandag aan besonderhede in die oprig van hierdie plek is fenominaal. En die rubels was seker ‘n aardige bedraggie. Vanaf die middel-19de eeu groei die Russiese gemeenskap in Nice. Die adel kom adem in die Provencale lug – Stalin se oupa sou dit nie kon beskostig nie. Teen die eeuwenteling word planne vir die katedraal opgeteken. Bouwerk begin in 1903 en word in 1912 voltooi. Die finale inwyding van die kerk vind in die 1930s plaas. Soos Parys, word Nice ‘n hawe vir vlugtende adel ná 1917. Dit is vir my interessant dat die kerk na Hl. Nikolaas, die wonderwerker van die 4de eeu, vernoem word, hy wat deur Europa vereer word en ook iets met Sinter Klaas te doen het – interessant omdat die hoeksteen van die Katedraal is deur ‘n ander Nikolaas gelê, hy wat vyf jaar daarna, met sy gesin, deur die Bolsjewieke tereggestel is. Die Katedraal is in ‘n park nie ver van die Gare de Nice (stasie), ‘n verrassing van grasperke en palmbome in die hart van die stad omring deur woonstelblokke. Dit is teleurstellend om te vind dat die imposante deure agter slot en grendel is en die groepies toeriste moet tevrede wees om die plek van buite af te neem, wat ek toe doen. Ek meen die argument is, as jy die binne wil ervaar, kom Saterdagaand 18h00 na die mis toe. Redelik, dog manipulerend. Aan een pediment is daar ‘n ikoon van die Doodskleed van Turin, sterk en gestileerd. Dit is ‘n ortodokse wêreld, dié, wat rakelend, ontwerpsinvloede van die Midde-Ooste toon – kyk die puntige vensters onder die uiespirale. Dié vensters sou nie onvanpas in die kalief se paleis wees nie. Tog, is daar enige iets meer Russies as die uiespirale, al ses van hulle aan daardie Katedraal?